I had a complete tear to my ACL and Meniscus. 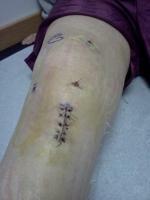 I had surgery on July 3, 2008 and had a hamstring harvest for the repair. I had severe pain for the first 3 weeks. I am able to walk now and I am doing well. The problem is that I have complete numbness from under my knee to my ankle. It is on the left side of my leg. I feel like I am getting shocks and needles all day long. I can not feel anything except for pressure and the pain feels like it is in my bone. It is especially painful at night. When I went to my post-op appointment at 4 weeks my doctor said it was normal, blew off my concerns and gave me nerve meds. Now I can sleep but the complete numbness is still there. When I asked the DR how long this would last he said I have a thick leg and it may take some time. I feel like his answers are not good enough. Do you think I should visit a neurologist? It had been over 6 weeks and nothing has changed?